The Research Network on the Determinants of Life Course Capabilities and Outcomes at the University of Chicago and the Center for Economic and Social Research (CESR) at the University of Southern California (USC) are organizing a two-day conference on social science genomics. The conference, “Polygenic Prediction and its Application in the Social Sciences,” will take place on Friday, November 30th and Saturday, December 1st, 2018, at USC¹s main campus in Los Angeles. The conference will bring together scientists with backgrounds in genetics and the social sciences. 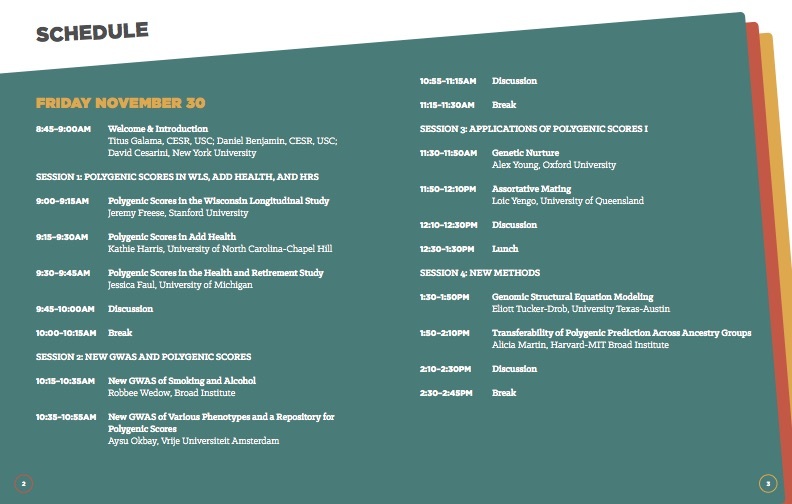 The first session will be an update on newly available polygenic scores that can be used for prediction. In the remainder of the conference, speakers will present new advances in the use of polygenic prediction, and examples of the use of genetic data in social science research. Peter Visscher, Professor and Chair of Quantitative Genetics at the University of Queensland and a recognized leader in human statistical genetics, has kindly agreed to be the keynote speaker.